• Are you desperate for some help with WordPress? • Have you been putting off your website edits for months because you’re busy actually running your business? • Did your friend the web developer find a real job and disappear, leaving you with an outdated website you can’t change? These are very common problems for the owners of the 60 million or so websites that currently run with WordPress. But here at Kempler Creative help has arrived! WORDPRESS WEDESDAYS. Every Wednesday we devote our time to helping people just like you with their WordPress problems. Whether you just have a question or you need a brand new website for your business, we are ready and waiting for your call or e-mail. One of the great things about WordPress is that once it is installed and set-up initially, maintenance and enhancements can be done relatively quickly. Often times, we can install WordPress and completely set-up a website within 3-4 hours. Future changes like adding/editing pages or even adding functionality can be done with just a few clicks! For WordPress Wednesdays, we offer free advice and help with wordpress sites. Please feel free to call or write and we will respond immediately. 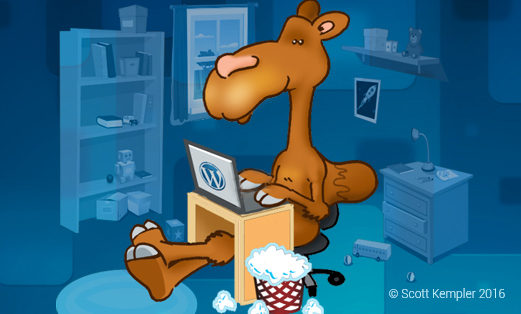 To help motivate you to get over the hump on your website, we also offer 5% off any website projects if you mention “WordPress Wednesday” in your job description.